Our annual trip to pembroke for 4 days is on. So far Dan, Nigel and Mick are going. Climbing mainly on limestone, camping but we may have an option of organising accomodation subject to final numbers. We need a fourth person – see the CC guide book link for more background information on the climbing. Check with us if you want to know more about routes and grades. Contact us if you would like to participate and not already a member. Alex is coming so we now have team of 4 – note that the dates given in the news letter are not correct – see website dates. Camping St Petrox confirmed. Tide times added. 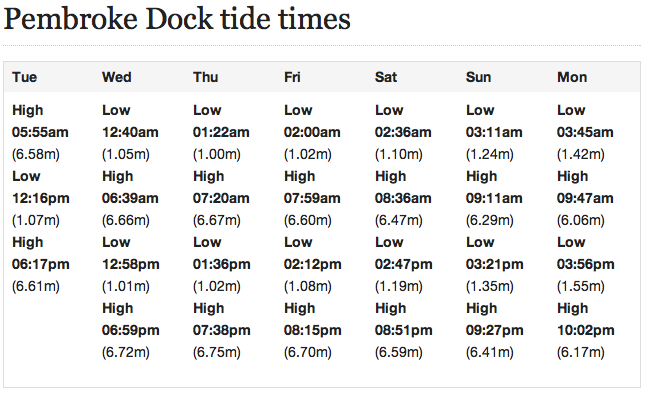 Low tide runs from 2pm through to 4pm over the 4 days, which works well. Did you get much done? See Nigel’s mini blog on routes done at Gogarth!!! Ok thanks Mick, looks like you had a good time.